The flight to Hagen is delayed. Sitting in a large room, the gates at the Jackson International Airport for domestic travel within Papua New Guinea are somewhat imaginary. There is one door. Someone announces what flight is leaving, and you line up and walk outside for a good a brisk walk. Attendants direct you to your airplane. You then must navigate up a steep portable staircase that felt like climbing straight up into the sky, and you enter the aircraft. To get a picture in your mind, just find a picture of domestic USA flights from several years ago. I am seated on what is my fourth leg of a 32-33 hour trip. The flight is up, and I realize an hour in I have spoken too soon. There are severe thunderstorms all around Mt Hagen, and the pilot cannot see the runway. Hagen is surrounded by mountains. As tired as I am and ready to get to my destination, I really do not want to run into a mountain! 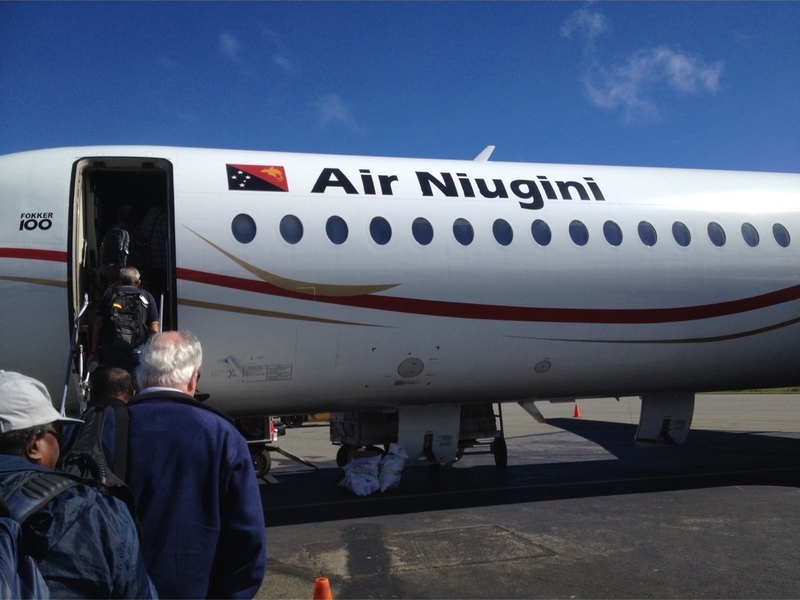 We are headed back to Port Moresby. I have no idea what I am going to do. I have no way to contact Principal Jacob Urri who is waiting for me in Hagen. I have no idea where I am going to stay the night in Port Moresby. But, the good news is: Jesus knows all about it, and He has it under control! The plane lands, and we get our luggage; I have lost track of how many times I have lugged my 116 lbs. of checked baggage around the world. After talking to someone at the airlines, the airline is putting us up in various hotels near the airport. I am in the group going to Citi-boutique (Which would become a favorite place of mine in a few weeks). Waiting to go to the hotel I meet several of my flight mates. I met a man named Paul who is from the highlands of Papua New Guinea, I meet two ladies who upon finding out that I am associated with the Nazarene church tell me how much they love the Nazarene church because of the many ministries that are making a difference in their country. I meet two missionaries with Youth with a Mission (YWAM) they are from Montana USA, and I meet two world travelers from the Czech Republic and three pilots from New Zealand. The Citi-Boutique hotel is a nice hotel. I was able to contact Susanne and Bennett, my son. I have heard from my contacts, and all is well. I sleep well. It is now Sunday morning the hotel transports us back to the airport for our second attempt at getting to Hagen. One memorable event of this trip was a 40-minute conversation with a New Zealand pilot a young man named Cam. He was holding a Gideon New Testament and looking at it, I asked him about it, and he told me that one of the pilots gave it to him. He is a young man in his early thirties, and he said to me that this was the first Bible he has ever seen or held. He has only been to church for a wedding, and he thinks maybe he attended a funeral at a church. We talk about spiritual things for a few moments, and I promise to pray for him, and I did, and I have since our encounter. As the plane begins to descend, he asks me if someone is going to meet me at the airport. I tell him that someone from the Bible College is going to meet me. He says to me that the town is too dangerous for a person to be walking around by themselves. He asks me a most interesting question: How do you know someone from your church is going to meet you at the airport? I asked him: If you had a family member promise to meet you at the airport today, would they abandon you and leave you on your own at the airport? “of course not” he replied. “That is how the church family is” I replied, “they are family, and they would never leave me.” That is how it is in the family of God. The plane landed, we got our luggage and said goodbye to our new friends. It is so amazing how close you can become to people by spending a little extra time with them. I loaded my luggage onto the cart and went through the doors of the airport… and there on cue was Principal Jacob Uri waiting on me. What a great family is this family of God. I am now ready to begin my sabbatical and journey in earnest! That was a great answer to that young pilot about the church being the family of God!